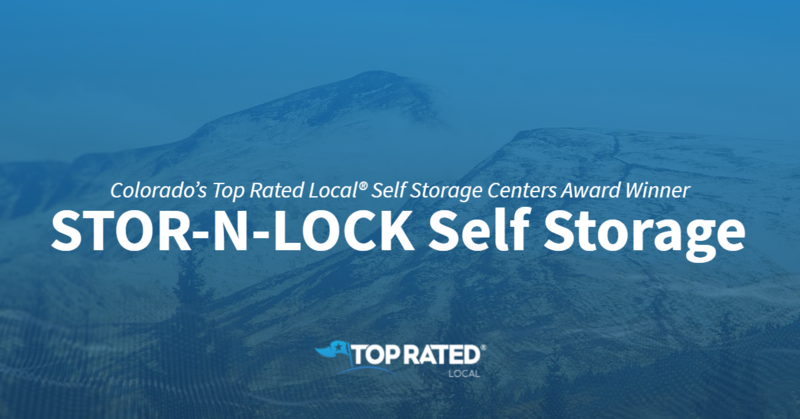 Top Rated Local® is pleased to announce that STOR-N-LOCK Self Storage is an award winner for self storage centers in 2018. If you are looking for a self storage center that will protect your belongings while offering you incredible customer service, look no further than this award-winning company! STOR-N-LOCK Self Storage of Aurora has received many overwhelmingly positive reviews across four different verified sites with an average rating of 4.69 stars, earning them an impressive Rating Score™ of 95.88 and a 2018 Top Rated Local award for ranking as one of the top 10 self storage centers in Colorado! “This place has a great staff! They have worked with me a few times when I was down on my luck. They really value their customers, and I appreciate that! You don’t find customer service like this these days; it’s rare. The facility is nice and clean as well.” – M.G. It is because of excellent reviews like this that STOR-N-LOCK Self Storage is now able to call themselves a Top Rated Local award winner! 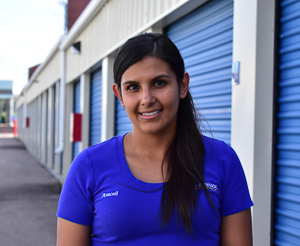 We were excited to learn all about how STOR-N-LOCK Self Storage has been able to build such an impressive reputation, so we sat down with the Location Manager, Araceli Iglesias. The first thing we wanted to know was what it is that makes STOR-N-LOCK Self Storage stand apart from their local competitors. We learned that customer service is truly valued at this storage facility. STOR-N-LOCK Self Storage of Aurora has managed to build an incredible reputation over the years, so we were excited to know more about some of the ways they have marketed themselves. In addition to being known for their incredible customer service, Araceli told us that she seeks out learning and networking opportunities by going to her competitors, apartment complexes, and real estate offices in order to have a greater understanding of what’s happening in the community and what kinds of services people are looking for. It’s no surprise that word-of-mouth referrals have been their greatest source for new business. Congratulations to STOR-N-LOCK Self Storage for being a 2018 Top Rated Local award winner, and special thanks to Araceli for taking the time to speak with us! Top Rated Local® is pleased to announce that A Better Place Funeral and Cremation is an award winner for funeral homes & services in 2019. If you are looking for, a funeral home that will offer you personal attention and transparent pricing options, look no further than this award-winning company! A Better Place Funeral and Cremation has received many overwhelmingly positive reviews with an average rating of 5.00 stars, earning them an impressive Rating Score™ of 92.00 and a 2019 Top Rated Local award for ranking as one of the top five funeral homes & services in Colorado! “Simply awesome! [They were] caring and compassionate and came to my home to assist me with my husband’s final arrangements. [They] made the whole process as painless as possible, which was so important given that his death was sudden and shocking. Additionally, the cost of the service was beyond reasonable and did not drain my financial resources. I am so lucky to have found them and am grateful for their help during this terrible time. Thank you so very much for your compassion and outstanding service!” – Tracey M.
It is because of excellent reviews like this that A Better Place Funeral and Cremation is now able to call themselves a Top Rated Local award winner! We wanted to know more about A Better Place Funeral and Cremation and how it has been able to establish itself as such an exceptional local business. We sat down for a chat with the owner, Jennifer Castillo, to talk about her business’ success. The first thing we were curious about was exactly what it is that makes A Better Place Funeral and Cremation stand out from the competition. Jennifer shared with us that hers is a family-owned and -operated business who make themselves available to their clients 24 hours a day. They are transparent about their pricing, and never turn down any cases. Jennifer said that they work with families who are going through bad situations, and it is important for their business to let these families know that they are there for them. A Better Place Funeral and Cremation has certainly built an impressive reputation for themselves online, so we were curious about what Jennifer had to say about how she markets and grows her business. Jennifer let us know that she hosts lectures in assisted living centers to help people to be prepared and to have the knowledge they need to make decisions. With her efforts in the community and their online reviews, word of mouth referrals have been vital to the growth of A Better Place Funeral and Cremation. 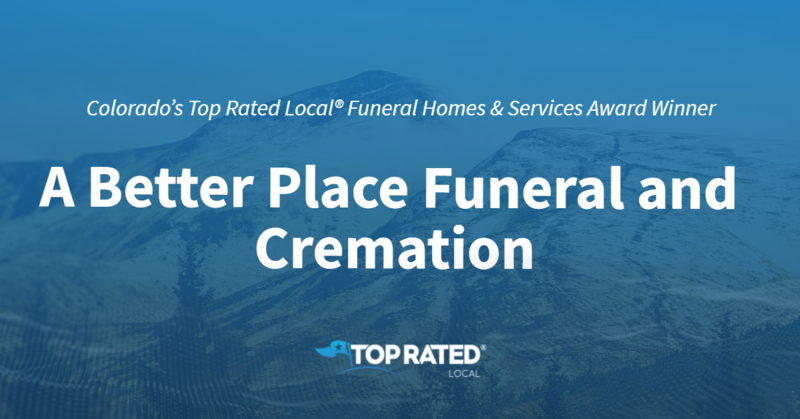 Congratulations to A Better Place Funeral and Cremation for being a 2019 Top Rated Local award winner, and special thanks to Jennifer for taking the time to speak with us! Top Rated Local® is pleased to announce that Metro Intelligence Agency is a 2018 award winner for private investigators! If you are in search of a company who will go above and beyond to ensure excellence of service, look no further than this award-winning business. Metro Intelligence Agency has received dozens of positive reviews, giving them an average rating of 4.90 stars, and earning them an impressive Rating Score™ of 92.10 and a 2018 Top Rated Local award! Metro Intelligence Agency works hard to ensure their clients’ happiness. To find out more about their business practices, we spoke with the company’s owner, James Bertrand. James’ level of experience is unique in the field and certainly makes Metro Intelligence Agency stand out among the crowd. Congratulations to the team at Metro Intelligence Agency for being a 2019 Top Rated Local award winner! Top Rated Local® is pleased to announce that Wise Guys Janitorial and Cleaning Service is a 2018 award winner! “These guys are incredible! They can do anything you need. They have a wide variety of expertise from large scale commercial buildings to construction/demolition clean-up. They’re prompt, solid, hard workers and they don’t miss a thing. They seem to enjoy what they do and take a great deal of pride in their work. I’ve used these guys for two very large, very different, assignments and they’ve far exceeded my expectations on both! Thank you, Wise Guys!” -Beth B. Reviews just like this have helped Wise Guys Janitorial to earn a perfect 5.00 average star rating on verified sites, a 78.00 Rating Score™, and a spot among the top 10 janitorial services in Colorado! If you’re looking for expert Janitorial services, you need look no further. Mike Ahmay, the owner of Wise Guys Janitorial and Cleaning Service, took some time to speak with us regarding his business’ exemplary online reputation. Thank you for speaking with us, Mike! 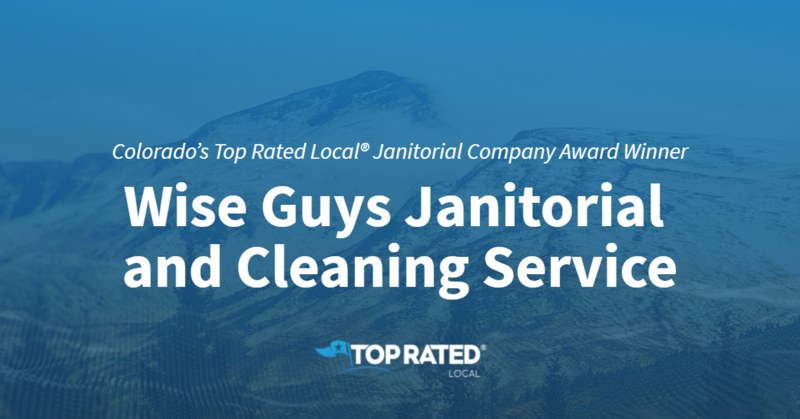 Congratulations to the team at Wise Guys Janitorial and Cleaning Service for being a 2018 Top Rated Local award winner! 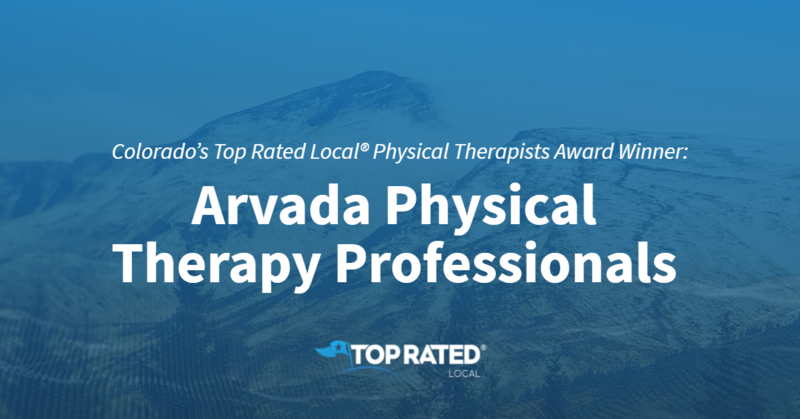 Top Rated Local® is pleased to announce that Arvada Physical Therapy Professionals is a 2018 award winner for physical therapists in Colorado! When you need physical therapy in Arvada, there’s no better option than Arvada Physical Therapy. Arvada Physical Therapy has received dozens of reviews on six verified sites with an average rating of 4.84 stars, earning them a wonderful Rating Score™ of 98.43 and a 2018 Top Rated Local award for being ranked the number one physical therapy clinic in all of Colorado! “When you’re in pain, it alters your attitude, mindset, energy level and so much more. David is a knowledgeable and talented physical therapist. I saw David two years after an intense car accident and attempts to heal with other physical therapists had not solved the problems. My pain became long-term and chronic, and David was able to help me feel better than I have felt in two and a half years! Thank you so much for helping me change my life!” – Sarah B. In order to learn a little more about Arvada Physical Therapy and how they managed to build such an incredible online reputation, we talked with the owner, David Berman. Outside of building a powerful online reputation, Arvada Physical Therapy Professionals has grown mostly through word of mouth, which David says is a result of their commitment to doing the best job they can for their patients. Congratulations to the team at Arvada Physical Therapy Professionals for being a 2018 Top Rated Local award winner, and thank you so much, David, for taking the time to speak with us! If you’re in need of physical therapy, we highly recommend working with David and his team at Arvada Physical Therapy Professionals. Visit their website today! Colorado’s Top Rated Local® Financial Advisers Award Winner: Strategic Financial Management, Inc.
Top Rated Local® is pleased to announce that Strategic Financial Management, Inc. is a 2018 award winner for financial advisers in Colorado! Whether you need help planning for retirement or determining where to invest your money, Strategic Financial Management, Inc. in Greeley can help. Strategic Financial Management, Inc. has received multiple reviews with an average rating of 5.00 stars, earning them a Top Rated Local award for ranking among the top 10 financial advisers in all of Colorado! “I recommend Strategic Financial Management, Inc. to my friends and family all the time. I have been trusting them for years, and I can’t imagine working with a better group of people.” – Monica B. We took a few minutes to talk with Debra, Executive Assistant at Strategic Financial Management, to learn a little more about the business and how they managed to build such an impressive online reputation. The first thing we asked Debra was what sets Strategic Financial Management apart from the many other financial advisory firms in Colorado. Debra highlights their one-one-one service and points to the fact that if a customer cannot make it to the office, the team at Strategic Financial Management will go to them! When asked what their secret is to such a strong online reputation at Strategic Financial Management, Debra credits Randee’s (President of Strategic Financial Management) years of experience in the business and to the fact that her service is personable and that she is always transparent and available for her clients. Outside of building a powerful online reputation, Strategic Financial Management has grown through word of mouth and generational repeat customers. Congratulations to the team at Strategic Financial Management, Inc. for being a 2018 Top Rated Local award winner, and thank you so much, Debra, for taking the time to speak with us! We highly recommend Strategic Financial Management, Inc. for all of your financial planning needs in Greeley. Visit their website today. 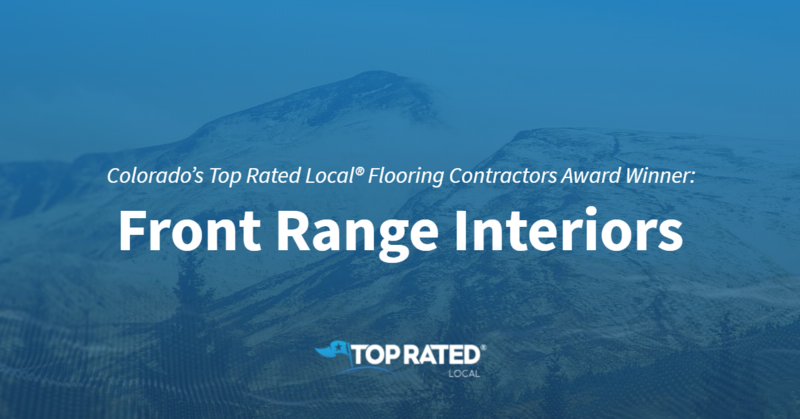 Top Rated Local® is pleased to announce that Front Range Interiors is a 2018 award winner for flooring contractors in the state of Colorado! If you are in need of a professional flooring contractor who provides exceptional service near Greeley, give the team at Front Range Interiors a call today. Front Range Interiors has over 20 ratings on 5 verified sites with an average star rating of 4.55 stars earning them a stunning Rating Score™ of 74.62 and a 2018 Top Rated Local award for being one of the top 10 flooring contractors in the entire state of Colorado. “I couldn’t be more happy with the work they did. The installers were so respectful coming into my home and did a fantastic job. The owner himself called the next day to make sure that we were satisfied with the outcome and I have to say I wouldn’t take my floor business anywhere else.” – Carrie E.
We took some time to speak with Jerry Keiser, owner of Front Range Interiors, because we wanted to find out exactly how he had helped build such an impressive business and online reputation. One thing we really wanted to understand when speaking with Jerry was how he had helped Front Range Interiors build such a strong online reputation. He credits much of their success to the staff he has working for him. He typically only hires locals who have years of experience in the field. In fact, they will often have 12 or more installers on site to make sure there is always sufficient expertise available. Congratulations to the team at Front Range Interiors for being a 2018 Top Rated Local award winner, and thank you so much, Jerry, for taking the time to speak with us! 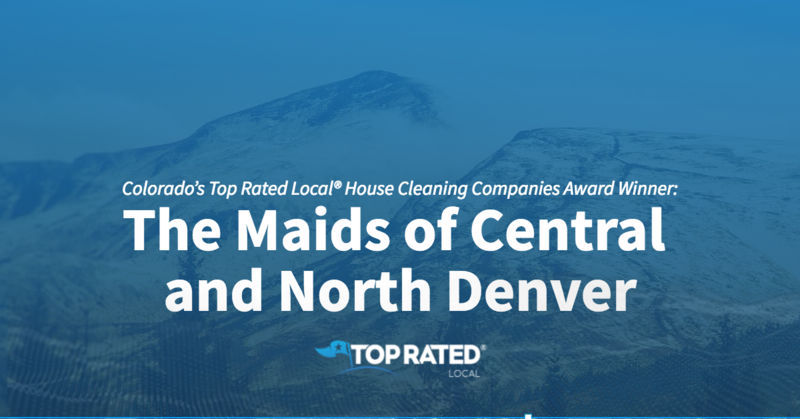 Top Rated Local® is pleased to announce that The Maids of Central and North Denver is a 2018 award winner for house cleaning companies in Colorado! If you’re looking for a cleaning company in Denver that can help keep your home spotless, look no further than The Maids of Central and North Denver. The Maids of Central and North Denver has received dozens of reviews on three verified sites with an average rating of 4.76 stars, earning them a phenomenal Rating Score™ of 93.56 and a 2018 Top Rated Local award for ranking among the top 10 house cleaning companies in all of Colorado! “The Maids have been cleaning my home for two years now, and I’ve been very pleased with their service. The ladies are thorough, efficient, and friendly. And the owners of the company are responsive and accommodating. 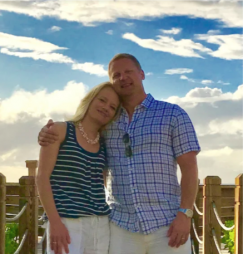 I highly recommend The Maids if you’re looking for a reliable cleaning service.” – Amanda G.
We took a few minutes to talk with Joe Quadhamer, the owner of The Maids of Central and North Denver, to learn a little more about the business and how they managed to build such an impressive online reputation. Outside of building a powerful online reputation, Joe has grown The Maids of Central and North Denver by providing a consistent product and making sure they are visible within the Denver market. Joe handles all of the marketing and sales on his own. Congratulations to the team at The Maids of Central and North Denver for being a 2018 Top Rated Local award winner, and thank you so much, Joe, for taking the time to speak with us! For all of your house cleaning needs, we highly recommend The Maids of Central and North Denver. Visit their website today! Top Rated Local® is pleased to announce that Don’s Garage Doors is a 2018 award winner! “My garage door would only open halfway, without going up or down. I called Don’s in the morning, and they had a technician out there within two hours. His name was Jess, and he was great. He explained in detail what he was going to do and was super helpful. I had left a message with the office after the service because I had a question/issue, and not only did a technician call me back but Don himself called later to follow up. EXCELLENT CUSTOMER SERVICE. I would totally recommend this place to anyone looking for help with their garage door!” -Tina M.
That’s just one of the many outstanding reviews Don’s Garage Doors has received, giving them a 96.98 Rating Score™ and 4.90 average rating and making them one of the top 10 garage door companies in Colorado for 2018. We spoke with Alexis, the office manager at Don’s Garage Doors, about the business’ impressive online reputation. Congratulations to the team at Don’s Garage Doors for being a 2018 Top Rated Local award winner, and thank you so much, Alexis, for taking the time to speak with us! Top Rated Local® is pleased to announce that I Do Windows is a 2018 award winner! “What a breath of fresh air! There is a small business owner who actually cares about his customer and the work he does. Not only did Wayne meet my expectations, he exceeded them. After nearly a year in our new home, I did not think I would ever see out of my windows clearly. With construction dirt, rain, and snow residue on all my windows, it would have taken me days to clean. Wayne was in and out in a short time and what he left behind is nothing short of spectacular. [I] will call again for sure.” -Suzann R.
“Wayne and his staff are amazing… [they offer] quality work at a fair price. His staff is well trained, very courteous, and really easy to have in your home. Wayne sends a text message to remind you of your appointment then a follow-up after the work is completed to make sure you’re happy with the work. I can’t say enough good things about these guys!” -Tom K.
Those are just two of the stupendous reviews that contributed to I Do Windows’ 96.00 Rating Score™ and five-star rating average on verified sites, as well as their spot among the top 10 window cleaning businesses in the entire state of Colorado. Wayne Sombric, the owner of I Do Windows, took some time to speak with us regarding his business’ fabulous online reputation. Thank you for speaking with us, Wayne! 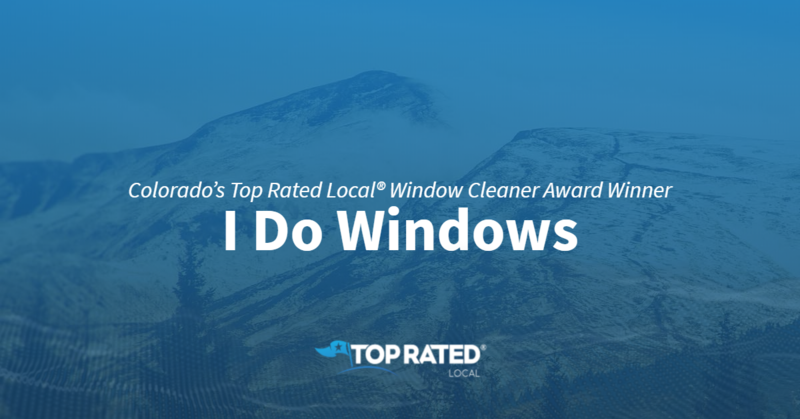 Congratulations to the team at I Do Windows for being a 2018 Top Rated Local award winner!